In Davao City, the name Uyanguren (or Oyanguren) is simply the old name of a long stretch of road which is now called R. Magsaysay Avenue. For those in the know, Oyanguren is actually Don Jose Cruz Maria de Oyanguren y Ybarzábal. He is known today as the founder of modern Davao City, a settlement he called Nueva Vergara after his hometown. The whole Davao region he christened Nueva Guipuzcoa after his home province in Spain. Today, on Davao City's founding anniversary as a city, we pay our tribute to the man who is credited to have established the Davao region and what is now Davao City, genealogy style, through this fourth article in the Davao genealogy series. José Oyanguren was a native of Guipuzcoa who went to the Philippines in 1825, leaving Spain for political reasons. He passed several years in the province of Caraga (now Surigao), engaged in business, and in the Calamianes. For a number years also he occupied the judicial post in Tondo. In 1846 he was deprived of that post because such offcials were thereafter appointed in Madrid. On hearing of the cession of the gulf of Davao by the sultan to the Spaniards, he visited that region. On his return he proposed to Governor Claveria to conquer and subdue the entire gulf district, expel or pacify the Moros there, and establish the Christian religion, if he were given supplies and equipment, the command of the district, and exclusive rights of trade therein. A decree issued by Claveria February 27, 1847, gave him the command for ten years and exclusive rights of trade for the first six years. He was also given artillery, muskets, and ammunition, and permission to raise a company. By the beginning of 1849 he was in peaceful possession of the entire coast-line of the gulf and then turned his attention into the interior. The government, however, did not live up to its promises, and Oyanguren after the death of Claveria was removed from his command. The last years of his life ( 1852-1859) were spent in the fruitless endeavor to obtain what had been promised him. While all histories of Davao City mention Don Jose Oyanguren in varying degrees, two renowned writers have so far been able to write extensively on him. The first one was Marina D. Suazo who wrote Davao: The Love Story of Don Jose de Oyanguren (Its Basque Colonizer). 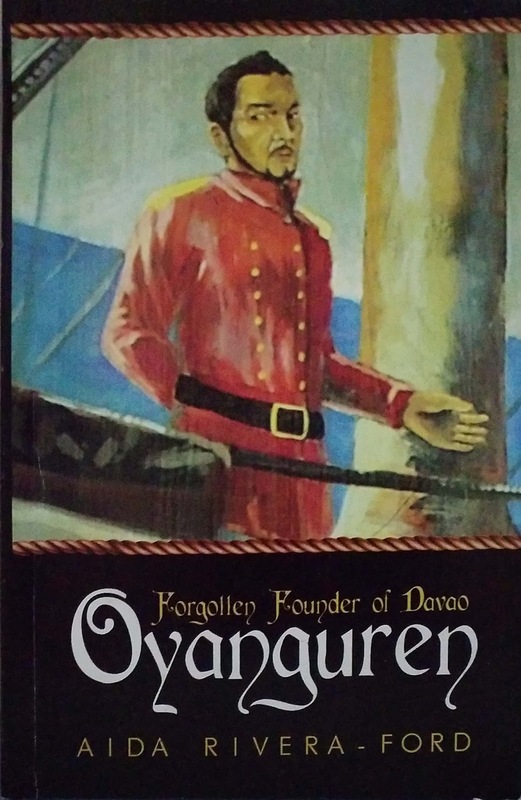 The second and most recent biography is by Aida Rivera-Ford's Oyanguren: Forgotten Founder of Davao. Published in 2010, it is by far the most comprehensive discussion of Oyanguren's conquest of Davao province. It is lovingly written and is meant to rekindle an interest in Oyanguren. In Ford's own words in one of her interviews, her 'greatest dream is to make Dabawenyos remember Don Jose Oyanguren, which she regards as the city's founder'. Much of Oyanguren's history is tied to his founding of Davao. Some have also focused on his love story with Maria Luisa Azaola. However, no discussion on Oyanguren's parentage or ancestry has ever been done and today, on the 81st anniversary of Davao City's establishment as a city, we finally complete the history of Davao's founder. The first clue that led me to Oyanguren's family is simple: I located his baptismal record which finally gave me the names of his parents and grandparents. After getting these names, it was just a simple step of checking online family trees. This led me to the Geneanet site showing Gonzalo Velasco Berenguer's family tree, which also let me further to more tidbits on the Oyanguren family through the Caseríos de Bergara site that discusses the properties of certain families from Vergara, Guipuzcoa, including the Oyangorens. Most recent histories of Jose Oyanguren have his birthday correctly. 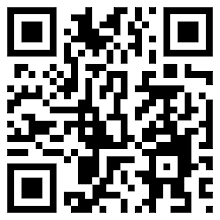 He was born on the first of May 1800 in a town called Villa de Vergara, in the province of Guipúzcoa, Spain. While the province was considered part of the Spanish kingdom (and remains so, today) it has always been seen by its inhabitants as a historical territory of the fiercely regionalistic Basques. Guipúzcoa was also home to many famous people in history and could count among its beloved sons and daughters Juan Sebastián Elcano, who is known as the first to circumnavigate the world; St. Ignatius de Loyola; Sta. Cándida María de Jesús who founded the Congregation of the Hijas de Jesús; and Miguel López de Legazpi, the conquistador who colonized the Philippines on behalf of his king. These possible influences, together with the fiercely independent streak that Basques are known for, probably later contributed to Oyanguren's desire to find his own niche in the world. He was immediately taken to the Parish of Saint Peter to be baptized a day after he was born. 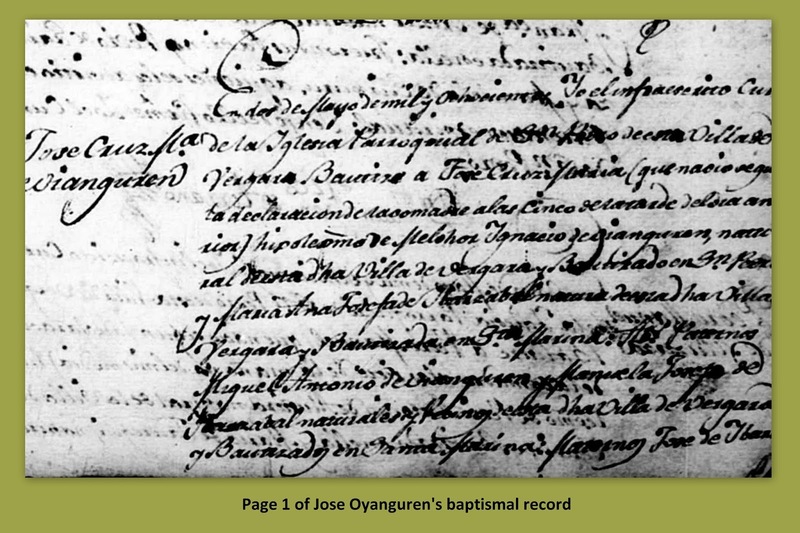 His baptismal record gives his full name as Jose Cruz Maria de Oianguren, the son of Melchor Ignacio de Oianguren and María Ana Josefa de Ybarzábal. His paternal grandparents were Miguel Antonio de Oianguren and Manuela Josefa Ybarzábal while his maternal grandparents were José de Ybarzábal and María Tomasa Aiastui. His godfather was Jose de Ybarzábal while his godmother was a Maria Ana de Ybarzábal, his grandfather and probably a sister of his mother. While some of Jose Oyanguren's biographies have stated that he came from a peasant family in Guipuzcoa, this is totally erroneous. In fact, the Oyangurens are one of the oldest and most prominent residents of Villa de Vergara. 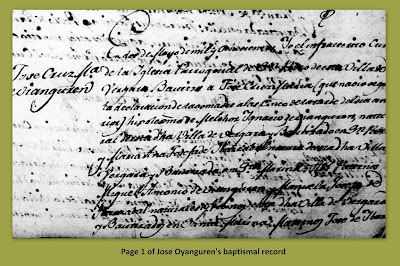 And while they were not of the nobility, enough records exist to indicate that the Oyangurens, and Don Jose's line in particular, had several properties in Vergara. One of the earliest mentions of an Oyanguren was in 1569, where listed among the inhabitants belonging to the parish of Santa Marina with the right to vote was a Pedro de Oianguren, almost certainly a direct ancestor of Don Jose Oyanguren. 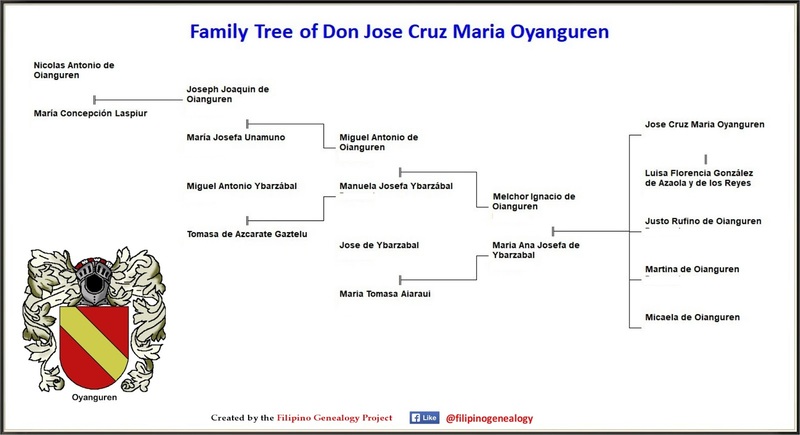 The earliest traceable ancestor of Jose Oyanguren is Nicolas Antonio de Oianguren, also from Villa de Vergara and who was married to Maria Concepcion Laspiur. Nicolas Antonio appears in a 1716 document where he requested permission to plant trees and where he indicated in his application that he and his ancestors have been owners and possessors of their house for generations. Nicolas Antonio's son, Joseph Joaquin de Oianguren, was born on June 11, 1713. He married Maria Josefa Unamuno on November 30, 1739 and they had at least two children: Miguel Antonio and Francisca Antonia. Miguel Antonio is the grandfather of Jose Oyanguren. Jose had 3 siblings: Justo Rufino, Martina, and Micaela. Being the eldest son he was named in his father's will as the executor and successor of his father's estate. As already mentioned above in Jose Montero y Vidal's brief biography of Jose Oyanguren, Oyanguren, left Spain for political reasons and went to the Philippines in 1825. It is unfortunate that there is not enough records that can shed light into the reasons why he left his homeland. Certainly, being the heir of his father's farmlands, he would have lived a comfortable life in Villa de Vergara. Instead, he left Guipuzcoa and settled in the Philippines. All write-ups on Don Jose's life have indicated that he was married only on his deathbed. In Ford's biography, she states that Don Jose had a "lady love" by the name of Maria Luisa Azaola whose brother, Antonio, was one of the Spaniards slaughtered by Moro pirates in 1844. In the chapter on Oyanguren's death, Ford wrote that Oyanguren only married Azaola a day before he died on October 10, 1858. Marina D. Suazo's book also say the same thing: that a deathbed marriage took place between Oyanguren and Azaola. 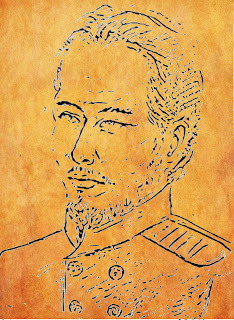 In the Suazo family tradition, it was in one of Oyanguren's sorties in Tandag where he met Luisa, the daughter of a capitan general by a local resident. The two agreed to live together as partners because Oyanguren, a Catholic, could not marry her because he had a wife in Spain. After Don Jose's death, she later bore a son by a man surnamed Monteroso who she married years after the Basque colonizer had died. 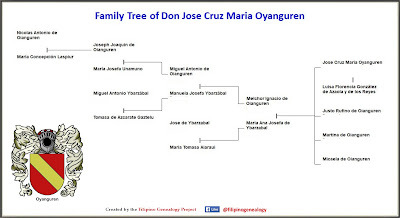 D. Jose Oyanguren, an adult Spaniard from Vergara, province of Guipuzcoa, married to Dna. Luisa Azaola, is interred on the 11th of October 1858 at the Vergara cemetery, having died the day before. The Spanish text states: D. Jose Oyanguren Espanol adulto natural de Bergara Provincia de Guipuzcoa casado con Dna. Luisa Azaola mismo el dia antes ala una y media. It is very clear that due to the way the sentence is written it would appear that they were indeed married the day before (October 10). But for those who are familiar with the way burial records are written, it is clear that what is meant by the entry is that D. Oyanguren, who is married to Dna. Luisa Azaola, died the day before. The truth is, Don Jose Oyanguren married Dona Luisa Azaola on September 5, 1843, at the Parroquia del Sagrario, Intramuros, Manila. This has been long been established by the descendants of Luisa, who bore 4 children after she remarried in 1861. More discussions will be made on Luisa Azaola in the next article. But for now, it should be understood that when Don Jose Oyanguren died in 1858, he and Luisa were already married. A fuller history, with his genealogy, is perhaps needed to get a clearer picture of this forgotten hero of Davao. For now, I hope this brief tribute has allowed the readers, especially Dabawenyo readers, a closer glimpse into the man who founded Davao. 1. Figueroa, Antonio V. “Conquest in the name of love.” Edge Davao, 15 Feb. 2016, http://edgedavao.net/special-feature/2016/02/15/conquest-in-the-name-of-love/. 2. Ford, Aida Rivera. 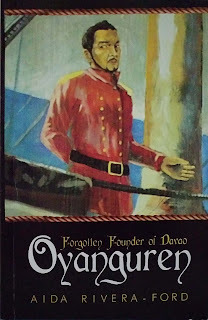 Oyanguren: Forgotten Founder of Davao. Mindanao Foundation for Culture and the Arts, Inc., 2010. 3. 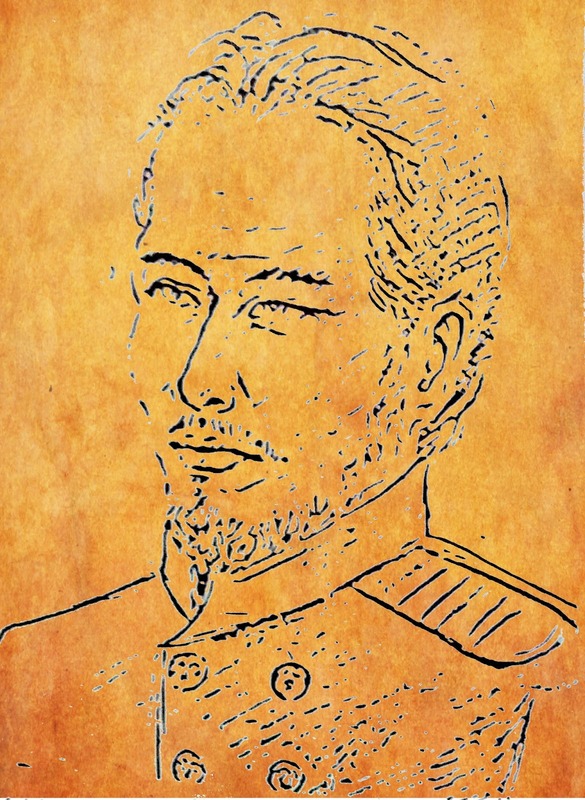 Suazo, Marina D. Davao: The Love Story of Don José de Oyanguren (Its BaSque Colonizer). Mindanao Times, 1980.